James was an electronic engineer, a profession he found immensely interesting and satisfying. He was always keen to share his love of the subject with everyone. To that end the James Ballantyne Memorial Fund has been set up to encourage and support young engineers and to advance education in STEM (Science, Technology, Engineering and Math) subjects. Bishop Wordsworth’s School, Salisbury. Extra-curricular STEM classes and activities are becoming increasing popular amongst school pupils. They foster and develop the skills involved in the subjects and most importantly get pupils excited about this field. Bishop Wordsworth is one such school offering these opportunities for its pupils and JBMF is pleased to be supporting them with this. The school provides a broad range of STEM extra-curricular activities including talks by guest speakers aimed at 6th form science students and STEM days throughout the school year. The schools STEM Club (aimed at Yr 7 to 9 students) is also taking part in the Bloodhound School Rocket Car Competition! Best of luck Bishop Wandsworth STEM Club! Wyvern College, Laverstock St Andrew have purchased an educational site software license and CNC router for use in their Design and Technology department. The technology has the potential to be used in electronics, engineering and science (robotics, parts for experiments) and even has applications in the arts (print block making, carving, theatre props etc). While using a CNC, students can engage in making something they are interested in while learning real-world manufacturing skills, math (Cartesian coordinates) and engineering. With our help they have also been able to provide their students with software that allows them to program the department’s router. This will benefit the students by giving them hands on experience of modern manufacturing techniques as well as Computer Aided Design (CAD). The software will be used for class projects in Yrs 7 to 11 and also in after school clubs. This is a great project giving budding engineers that first-hand experience and knowledge that is so valuable in this competitive field as well as giving them another facility to develop and express their passion for the subject. The Willink School, Burghfield Common are using their grant to replace their old projection equipment in the STEM classrooms with interactive white boards and projector. All pupils at the school will benefit from this and especially A-level students studying STEM subjects. The Petersfield School, Petersfield. Greenpower Team, a STEM after school club encourages children to explore aspects of engineering, design and team work. They bought, built and customized a formula 24 kit car and then raced it at Goodwood. The JBMF grant went towards purchasing a second car, renewing tyres, batteries, cabling and bodywork materials. The grant also helped towards future race entry fees. The Peterfield School will also be refitting a disused garage as their Greenpower workshop, involving 32 pupils and supported by keen and helpful parents. Eggar’s School, Alton. In order to provide a practical and ‘real life’ programming opportunity for learners, money from the JBMF grant was used to purchase a set of EV3 robots (lego). The robots can be used and integrated into the computing curriculum, helping students to design, build and test algorithms. This can facilitate the development of student programming skills in all years, enabling the computing department to improve the delivery of computing through practical activities and development work. Funding will hopefully help start an extra-curricular robotics club not only for all students but also attract more pupil premium/disadvantaged students to engage with technology that may not be otherwise available to them. Many thanks to the JBMF - your generosity to our school has already made an impact on our students. Crookhorn College, Waterlooville, Portsmouth. Pupils using a JBMF funded 3D printer are now able to produce final BTEC engineering coursework. The students are able to achieve merit and distinction grades as 3D printed outcomes are a requirement of the higher level assessment criteria. 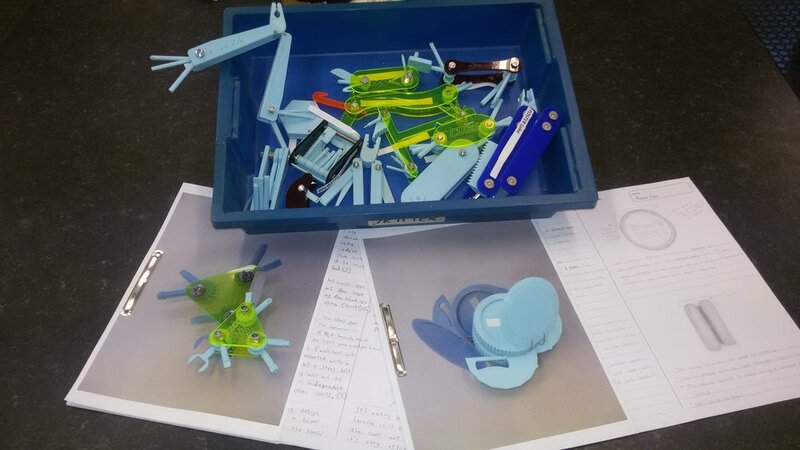 Yr 9 to 11 students are able to realise designs modelled on 3D Computer Aided Design (CAD) software and convert into 3D printed components. If you feel you have any projects; any equipment, clubs or trips requiring support which meet the JBMF criteria we would love to hear from you.